Research has revealed that the use of morphine is highly effective in pain relief, but that long-term use of opioids could produce complex behavioral changes such as tolerance, dependence, and sensitization , probably due to changes in synaptic plasticity after long-term use of these agents. Some studies have shown that the level of endogenous opioid decreases in discrete brain regions during morphine dependence., It has, therefore, been suggested that treatment of morphine tolerance and addiction is associated with the prevention of synaptic modifications. Morphine addiction is a chronic disorder that requires long-term treatment and medications have been developed that add to the benefits of psychosocial interventions for the prevention of craving and relapse. Nevertheless, most of these treatments have failed to produce satisfactory results. Aerobic exercise has been shown to promote memory and other brain functions. Physical exercise is also reported to influence the central dopaminergic, noradrenergic, and serotonergic systems. In particular, it leads to the release of certain neurotransmitters in the brain that alleviates both physical and mental pain. Studies have not only shown that the intensity of aerobic exercise is positively correlated with the release of opioid peptides but have also claimed that exercise might produce cross-tolerance to opioid agonists. This hypothesis is supported by reports showing that chronic and voluntary wheel running decreases the anti-nociceptive response to mu-opioid drugs. In contrast, induction of aversive responses in the condition place preference has been reported by these kinds of exercise to the kappa opioid drugs. Accordingly, physical exercise might be used as a valuable aid to help people recover from morphine-addiction. Given the fact that the analgesic effects of exercise are due to the release of endogenous opioids, the present study was conducted to determine: (1) whether aerobic exercise would prevent morphine self-administration and (2) whether central and peripheral anti-nociceptive actions of morphine would be modulated after physical activity. Randomly selected male Wistar rats (250–300 g) were group-housed and provided with food and water ad libitum. They were maintained under a day–night cycle with lights on between 07:00 and 19:00 h before they underwent surgery to implant an infusion system. After the surgery, the animals were placed in individual home cages where they were left to recover from the operation for 5 days before the experiment. The day–night cycle was reversed for 3 days before the tests, and the animals were recorded during the dark phase of the cycle. All the operations were carried out as recommended by the Ethical Committee of Isfahan University. Morphine + Exercise group (M + E), in which the rats were run for 30 days on the treadmill followed by a 30 min break before they were placed in the self-administration apparatus to receive as much morphine as the animals in the morphine group would. At the end of the experiment, all the animals received naloxone (2 mg/kg, s.c.) and withdrawal signs were recorded for 30 min. Before running on the treadmill, the rats were left for a few days with it to learn how to run on the treadmill. This also helped identify the sick or lazy rats, which would then be excluded from the experiment. The remaining rats would then undergo the iv cannulation and allowed for 6 days to recover from the surgery. The running period for all the groups consisted of 5–60 min of running for 30 days on a flat treadmill at a rate of 5–20 m/min. After a 30 min break, they would be placed in the self-administration apparatus and continuous experiments for 11 days. All the surgical procedures were conducted under chloral hydrate (450 mg/kg) used as the anesthesia and the jugular vein was exposed. The catheter would be inserted into the jugular vein through a hole previously marked and guided subcutaneously up to the skull. The catheter would then be fixed to a metal tube, secured to the skull with small screws, and fixed with dental acrylic cement. After the cement completely dried and hardened, one stainless steel stylet would be used to occlude the catheter during the recovery period. Finally, the animals were individually housed and allowed to recover for 5–7 days before the experiments. Seven days after recovery and following 24 h of food restriction, the rats were placed into the operant chambers where a lever filled with food pellets was available. Each active lever pressing resulted in the delivery of a 100-mg pellet. The jugular cannula was connected to an infusion pump, and the animals were placed in the self-administration apparatus for 2 h and each day on a fixed ratio of one schedule. The trained animals were allowed to press active and passive levers freely. By pressing the active lever, the rats would receive 0.1 ml of morphine and small pellets during the first 6 days, and morphine without pellets in the final 5 days of the experiment. Pressing the passive lever would not deliver any fluid or food. Food availability was restricted during the first 6 of the self-administration period for rats to reduce body weight by 15%; this practice has been shown to facilitate the initiation of iv self-administration. Changes of <15% in the number of injections during the past 3 days were considered as the baseline. On the following 5 days, the animals had free access to food. Catheters were flushed daily with 0.1 ml saline containing heparin sulfate (50 U/ml) during the recovery period as well as before and after the self-administration sessions. All the operant sessions were conducted during the animals' dark cycle during this phase of experiments. Catheter potency was tested by the injection of 0.1 ml of sodium pentobarbital solution (10 mg/ml) into the catheter and animal behavior was subsequently observed. Animals with potent catheters exhibited prominent signs of anesthesia (loss of muscle tone) a few seconds after drug administration. Using a naloxone injection (2 mg/kg), withdrawal syndrome signs (climbing, grooming, stretch, defection, teeth chattering, jumping, genital grooming, and shaking) were precipitated and recorded within 30 min after the injection of naloxone on the last day of the experimental period. Before injection of naloxone, nociceptive behavior tests have been done. The tail flick examination using a slightly modified version of the method described in D'amour and Smith  was used to determine analgesic and anti-nociceptive activities in rats. For this purpose, a radiant heat automatic tail flick analgesiometer was employed to measure reaction latencies. The basal reaction time of animals was recorded by locating the tip (the end 1–2 cm) of the tail on the radiant heat source. Tail removal from the radiant heat was taken as the endpoint. A cutoff time of 15 s was allowed to avoid tail injury by heat. The latent periods of the tail flick response were determined 30, 45, and 60 min after drug administration on the last day of the experimental period. After this time, each rat received naloxone and transferred it to other cage, and the withdrawal signs were recorded. The hot-plate test was used to determine analgesic activity according to the method described in Eddy and Leimbach  with minor modifications. In brief, the rats were retained on a hot plate at a constant temperature of 55°C ± 1°C. The time taken for either paw licking or jumping was recorded. Each rat was individually placed on the hot plate to find the animal's reaction to electrical heat-induced pain (licking of the forepaws and eventually jumping). A cut-off time of 50 s was used to avoid injury by heat. The latency until the rat showed the first signs of discomfort (hind paw lifting, hind paw licking, or jumping) was recorded, before (baseline), and the response was determined 30, 45, and 60 min after drug administration on the last day of the experimental period. The data obtained were reported as means ± standard error of the mean the different groups were compared with respect to their active and passive lever pressings and number of self-infusions using the repeated-measures one-way analysis of variance (ANOVA) and Tukey's post hoc comparisons. The mean values for the number of active and passive lever pressings during the past 6 days, the number of active and passive lever pressings in each session among the different groups (summed over eleven sessions), and the withdrawal signs and reaction times of the tail flick and hot plate tests were compared using the one-way ANOVA and Tuckey's post hoc comparisons. The results were declared statistically significant at P < 0.05. [Figure 1] presents the number of self-infusions at the initiation of morphine self-administration. 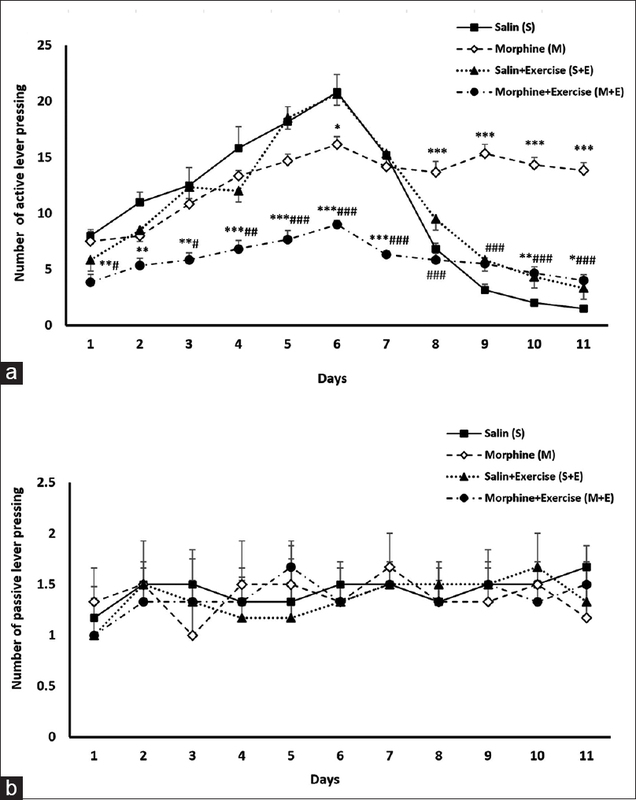 Running activity significantly (P< 0.001) decreased the number of self-infusions during the past 6 days in the morphine + exercise (M + E) group compared with the morphine (M) group. This is while no insignificant increase was observed in the number of self-infusions in the saline + exercise (S + E) and morphine + exercise (M + E) groups compared with the saline (S) group. The number of active lever pressings was significantly (P< 0.001) higher in the morphine group than that in the saline group [Figure 2]a, indicating that the animals pressed the active lever to obtain morphine. However, the number of active lever pressings significantly (P< 0.001) decreased in the exercise + morphine group compared with the morphine and saline groups [Figure 2]. No significant differences were observed across the groups in the number of passive lever pressings [Figure 2]b. All the groups exhibited a significantly (P< 0.001) higher mean number of active lever pressings during the past 6 days (i.e., following the end of food restriction) than that of passive lever pressings [Figure 3]. 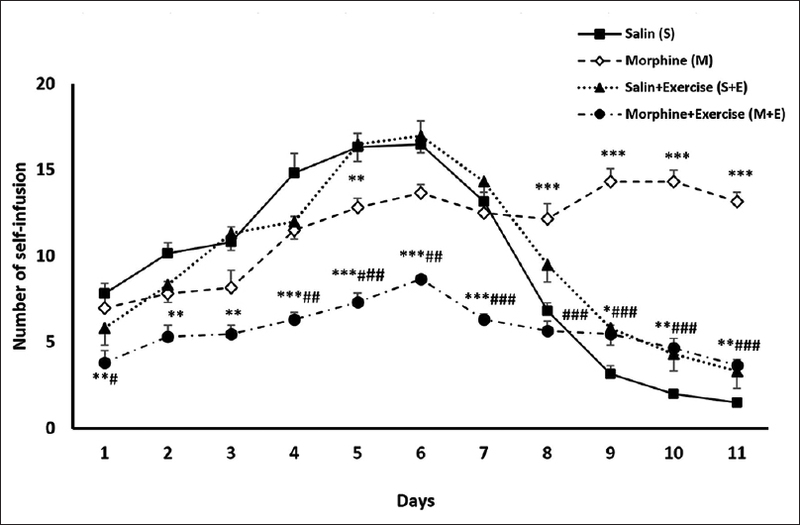 As shown in [Figure 3], the mean number of active lever pressings during the past 6 days significantly increased (P< 0.001) in the morphine group compared with the saline group [Figure 3]. The exercise group exhibited a significantly lower mean number of active lever pressings during the past 6 days than did the saline and morphine groups (P< 0.01 and P < 001, respectively). There is no evidence why exercise reduced number of active lever pressing compared to control group. It is possible that saline group did not receive morphine during experiment and motor movement is high. The withdrawal signs, such as climbing, grooming, stretching, defection, teeth chattering, jumping, genital grooming, and shaking, are reported in [Table 1]. These signs were recorded 30 min after the naloxone injection 12 days after drug self-administration. Clearly, nearly all the signs exhibited significantly fewer occurrences in the morphine + exercise group as compared with the morphine group. No significant differences (P > 0.05) were observed among the groups with respect to the anti-nociceptive effect in the tail flick test [Figure 4]a. The analgesic effect of exercise was, however, significantly greater in the morphine + exercise group than that in the morphine group. This latter group exhibited a significantly greater number of reaction times to the hot plate than did the saline group after 30, 45, and 60 min (P< 0.01, P < 0.01, and P < 0.001, respectively) [Figure 4]b. The exercise was found to have a significant influence on the reaction times by the animals to the hot plate after 30, 45, and 60 min when compared with the morphine group only [Figure 4]b. 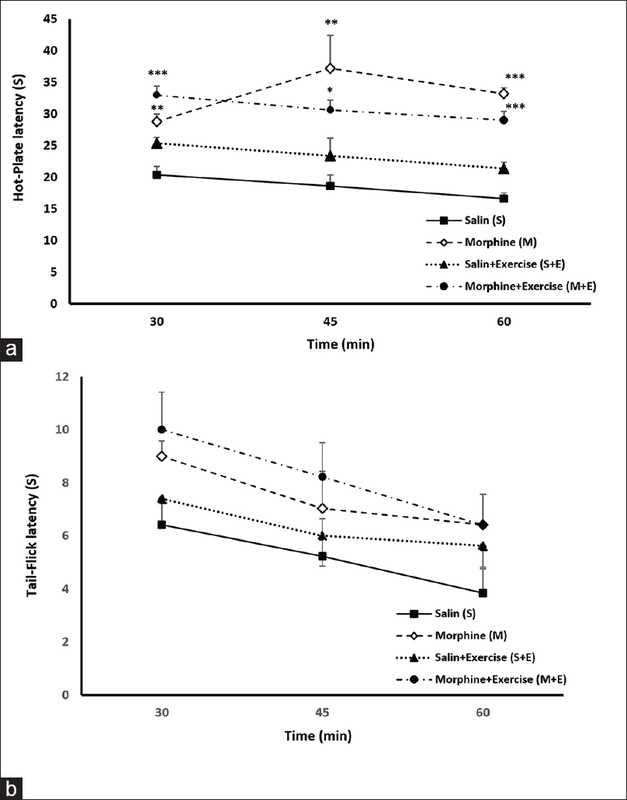 Moreover, exercise was observed to have a significant effect on the anti-nociceptive activity as measured after 30, 45, and 60 min in the morphine + exercise group when compared with the saline group [Figure 4]b. The study results showed that exercise reduced the numbers of both active lever pressings and morphine infusions. On the other hand, morphine self-infusion and morphine-induced craving behavior were attenuated after running in the exercise protocol used in this study. These results agree with those of other studies that showed treadmill running exercise reversed memory deficit after morphine administration and that forced exercise improved passive avoidance memory in morphine-exposed rats., Previous research had shown that treadmill running improves long-term potentiation in the dentate gyrus and promotes spatial memory in rats.,, In a recent study, number of infusions, which characterizes addiction to morphine, was found to decline with exercise [Figure 1]. In agreement with these results, the heroin-seeking behavior in a self-administration paradigm reportedly reduced in mice. Chronic exercise has also been reported to reduce sensitivity to morphine effects, and experimental rhythmic exercise has been claimed to activate the central opioid systems. The study has also shown exercise to be a useful component of alcohol treatment programs  and to have a positive effect on smoking cessation. Our results also indicated that aerobic exercise in the morphine group of rats decreased the intensity of their withdrawal syndrome signs [Table 1] compared with the no-exercise morphine group, indicating the role of exercise in inhibiting morphine utilization. These results of our experiments are different with others which did training less than this time and also the kind of exercise (our exercise was aerobic and 30 days). The mechanism involved may be the activation of the endogenous opioid system by treadmill running; this hypothesis is confirmed by the results of others studies which indicate that cerebrospinal fluid beta-endorphin levels increase as a result of voluntary chronic running in rats., Overall, the evidence shows that endogenous opioid levels increase after exercise. The next step in this study was to investigate the effect of exercise on central and peripheral pains. Our results showed that the analgesic effect of morphine decreased significantly under exercise [Figure 4]. In agreement with this finding, previous investigations have revealed the long-lasting anti-nociception effect of aerobic exercise in untreated animals. Moreover, aerobic exercise has been found to alleviate not only chronic neuropathic pain  but also chronic muscle pain. Shokraviyan et al. showed that the analgesic effect of exercise was greater in rats treated with morphine than that in those receiving saline. The present results revealed that running activity attenuated the analgesic effect of morphine in central pain in the hot plate test but had no such effect on peripheral pain in the tail flick test [Figure 4], probably due to the release of endogenous opioid in the brain. Contrary to our results, those of previous studies indicate the reduced tail withdrawal latencies in the exercise group relative to the sedentary group; these results were, however, unexpected and could not be readily explained by endogenous opioid activity. This is while other studies have shown that centrally acting drugs, such as opioids, prevent both phases of pain. 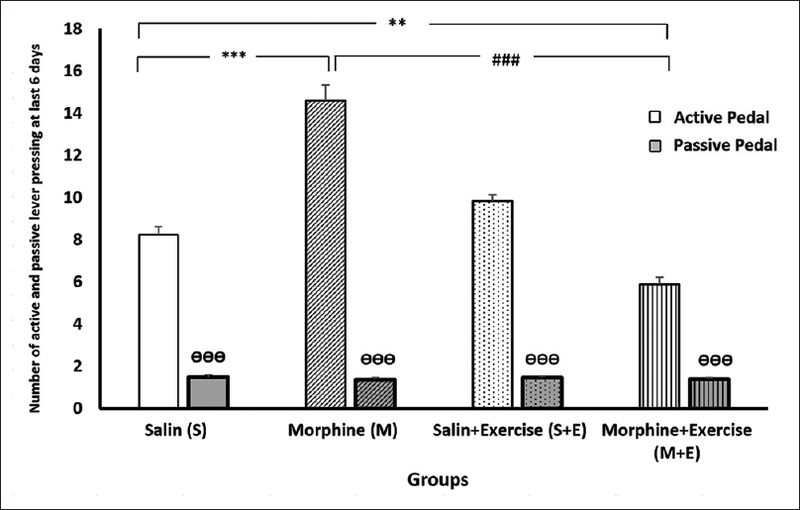 The anti-nociceptive effect was observed in this study to increase in the morphine group relative to the saline one [Figure 4]. Our results also showed that aerobic exercise was more effective in the central rather than in the peripheral anti-analgesic effect of morphine, suggesting a central anti-nociceptive mechanism possibly involved. The mechanism involved in the exercise-induced analgesia is not fully known, but it may be explained in part by the activation of endogenous opioid-mediated pain modulation systems. It has been shown that aerobic exercise stimulates the release of beta-endorphin and other endogenous opioid peptides that are believed to be responsible for the increased nociceptive threshold after training. Support for these results comes from the findings of a study that showed the opioid antagonist naloxone to prevent elevated nociceptive threshold following exercise in normal volunteers . In this study aerobic exercise reduced craving to morphine by decreased number of active lever pressing. It could be preventing the development of morphine dependence via self-administration and analgesic effects of morphine reduced centrally by hot plate test. The intensity of aerobic exercise is positively correlated with the release of beta-endorphin and other opioid peptides. Shurman J, Koob GF, Gutstein HB. Opioids, pain, the brain, and hyperkatifeia: A framework for the rational use of opioids for pain. Pain Med 2010;11:1092-8. Nestler EJ. Cellular basis of memory for addiction. Dialogues Clin Neurosci 2013;15:431-43. Ko SW, Wu LJ, Shum F, Quan J, Zhuo M. Cingulate NMDA NR2B receptors contribute to morphine-induced analgesic tolerance. Mol Brain 2008;1:2. Gudehithlu KP, Tejwani GA, Bhargava HN. Beta-endorphin and methionine-enkephalin levels in discrete brain regions, spinal cord, pituitary gland and plasma of morphine tolerant-dependent and abstinent rats. Brain Res 1991;553:284-90. Rattan AK, Koo KL, Tejwani GA, Bhargava HN. The effect of morphine tolerance dependence and abstinence on immunoreactive dynorphin (1-13) levels in discrete brain regions, spinal cord, pituitary gland and peripheral tissues of the rat. Brain Res 1992;584:207-12. Schinder AF, Poo M. The neurotrophin hypothesis for synaptic plasticity. Trends Neurosci 2000;23:639-45. Lett BT, Grant VL, Koh MT, Flynn G. Prior experience with wheel running produces cross-tolerance to the rewarding effect of morphine. Pharmacol Biochem Behav 2002;72:101-5. Nijs J, Malfliet A, Ickmans K, Baert I, Meeus M. Treatment of central sensitization in patients with 'unexplained' chronic pain: An update. Expert Opin Pharmacother 2014;15:1671-83. Bao Y, Gao Y, Yang L, Kong X, Yu J, Hou W, et al. The mechanism of μ-opioid receptor (MOR)-TRPV1 crosstalk in TRPV1 activation involves morphine anti-nociception, tolerance and dependence. Channels (Austin) 2015;9:235-43. Alaei H, Esmaeili M, Nasimi A, Pourshanazari A. Ascorbic acid decreases morphine self-administration and withdrawal symptoms in rats. Pathophysiology 2005;12:103-7. Brown RM, Short JL, Cowen MS, Ledent C, Lawrence AJ. A differential role for the adenosine A2A receptor in opiate reinforcement vs. opiate-seeking behavior. Neuropsychopharmacology 2009;34:844-56. Kim SY, Chudapongse N, Lee SM, Levin MC, Oh JT, Park HJ, et al. Proteomic analysis of phosphotyrosyl proteins in morphine-dependent rat brains. Brain Res Mol Brain Res 2005;133:58-70. D'Amour FE, Smith D. A method for determining loss of pain sensation. J Pharmacol Exp Ther 1941;72:74-9. Eddy NB, Leimbach D. Synthetic analgesics. II. Dithienylbutenyl- and dithienylbutylamines. J Pharmacol Exp Ther 1953;107:385-93. Alaei H, Borjeian L, Azizi M, Orian S, Pourshanazari A, Hanninen O, et al. Treadmill running reverses retention deficit induced by morphine. Eur J Pharmacol 2006;536:138-41. Radahmadi M, Alaei H, Sharifi MR, Hosseini N. The effect of synchronized forced running with chronic stress on short, mid and long-term memory in rats. Asian J Sports Med 2013;4:54-62. Radahmadi M, Hosseini N, Alaei H. Effect of exercise, exercise withdrawal, and continued regular exercise on excitability and long-term potentiation in the dentate gyrus of hippocampus. Brain Res 2016;1653:8-13. Reisi P, Babri S, Alaei H, Sharifi MR, Mohaddes G, Lashgari R, et al. Effects of treadmill running on short-term pre-synaptic plasticity at dentate gyrus of streptozotocin-induced diabetic rats. Brain Res 2008;1211:30-6. Alaei H, Moloudi R, Sarkaki AR, Azizi-Malekabadi H, Hanninen O. Daily running promotes spatial learning and memory in rats. Pathophysiology 2007;14:105-8. Guindon J. A novel inhibitor of endocannabinoid catabolic enzymes sheds light on behind the scene interplay between chronic pain, analgesic tolerance, and heroin dependence. Neuropharmacology 2017;114:168-71. Smith MA, Yancey DL. Sensitivity to the effects of opioids in rats with free access to exercise wheels: Mu-opioid tolerance and physical dependence. Psychopharmacology (Berl) 2003;168:426-34. Bidari A, Ghavidel-Parsa B, Rajabi S, Sanaei O, Toutounchi M. The acute effect of maximal exercise on plasma beta-endorphin levels in fibromyalgia patients. Korean J Pain 2016;29:249-54. Lipowski M, Szulc M, Buliński L. Physical activity among other health-related behaviors in treatment of alcoholism. J Sports Med Phys Fitness 2015;55:231-40. Underner M, Perriot J, Peiffer G, Meurice JC. Effects of physical activity on tobacco craving for smoking cessation. Rev Mal Respir 2016;33:431-43. Chen J, Lin D, Zhang C, Li G, Zhang N, Ruan L, et al. Antidepressant-like effects of ferulic acid: Involvement of serotonergic and norepinergic systems. Metab Brain Dis 2015;30:129-36. Mathes WF, Kanarek RB. Chronic running wheel activity attenuates the antinociceptive actions of morphine and morphine-6-glucouronide administration into the periaqueductal gray in rats. Pharmacol Biochem Behav 2006;83:578-84. Cobianchi S, Marinelli S, Florenzano F, Pavone F, Luvisetto S. Short-but not long-lasting treadmill running reduces allodynia and improves functional recovery after peripheral nerve injury. Neuroscience 2010;168:273-87. Bement MK, Sluka KA. Low-intensity exercise reverses chronic muscle pain in the rat in a naloxone-dependent manner. Arch Phys Med Rehabil 2005;86:1736-40. Shokraviyan M, Miladi-Gorji H, Vaezi GH. Voluntary and forced exercises prevent the development of tolerance to analgesic effects of morphine in rats. Iran J Basic Med Sci 2014;17:271-7. Smith MA, Lyle MA. Chronic exercise decreases sensitivity to mu opioids in female rats: Correlation with exercise output. Pharmacol Biochem Behav 2006;85:12-22. Stagg NJ, Mata HP, Ibrahim MM, Henriksen EJ, Porreca F, Vanderah TW, et al. Regular exercise reverses sensory hypersensitivity in a rat neuropathic pain model: Role of endogenous opioids. Anesthesiology 2011;114:940-8. Koltyn KF. Analgesia following exercise: A review. Sports Med 2000;29:85-98. Droste C, Meyer-Blankenburg H, Greenlee MW, Roskamm H. Effect of physical exercise on pain thresholds and plasma beta-endorphins in patients with silent and symptomatic myocardial ischaemia. Eur Heart J 1988;9 Suppl N:25-33. Bekkouche NS, Wawrzyniak AJ, Whittaker KS, Ketterer MW, Krantz DS. Psychological and physiological predictors of angina during exercise-induced ischemia in patients with coronary artery disease. Psychosom Med 2013;75:413-21.